Portland, Oregon– October 5, 2016 – After a successful introduction of the Heart-Check certification for Green and Red Anjou pears last season, USA Pears expands American Heart Association’s heart-healthy branding to Bartlett and Bosc pears from the Northwest. The top three pear varieties produced by Northwest growers remain the same as in previous years: Green Anjou pears are anticipated to make up 50% of the total 2016 crop, and Bartlett and Bosc pears are expected to yield 23% and 17%, respectively. “We received positive feedback from retailers and nutritionists throughout the industry when we launched the Heart-Check certification of Anjou pears in the spring and are pleased to expand the program to new varieties.” said Kevin Moffitt, president and CEO of Pear Bureau Northwest. The American Heart Association Heart-Check mark is found on all Anjou, Bartlett and Bosc POS, social media and web content and will be a feature in February’s American Heart Month and National Nutrition Month in March promotions. The Pear Bureau Northwest is an 85-year-old nonprofit marketing organization established to promote the fresh USA Pears grown in Washington and Oregon. The Bureau represents nearly 1,600 growers that produce 84 percent of the nation’s heirloom, fresh pear crop and develops national and international markets for Northwest pear distribution. 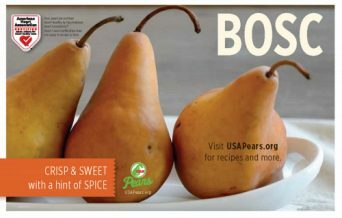 For more information, visit www.usapears.org, www.facebook.com/USApears, and follow @USApears on Twitter.